For your local needs in garage door repair | Crosby Garage Door Co.
You’ll receive only the best care and industry-leading products from Mike and his professionals at Crosby Garage Door Co. in Greensberg, PA. With our competently trained team and many years of service, we can help you with the installation and repair of your garage door system (both the door and the electric garage door opener), and for our team, GARAGA garage doors are the best option on the market. We have also taken the time to extensively train our technicians, which means you can trust us for all your local garage door repair needs. No problem is too big, and we’ll ensure that your garage door system remains fully functional and secure for many years to come. No problem is too difficult for us! Entrust all your local garage door repair needs to us and we will solve them to your complete satisfaction. WHY CHOOSE Crosby Garage Door Co.
We cover the areas of: Delmont, Export, Greensburg, Irwin, Jeannette, Johnstown, Latrobe, Ligonier, Monroeville, Murrysville, New Stanton, Penn, Youngwood and all of Westmoreland County. In Greensburg, we cover the neighborhoods of Marguerite / Humphreys, Luxor / Bovard and Armbrust / Midway. Contact us today to get a free quote! 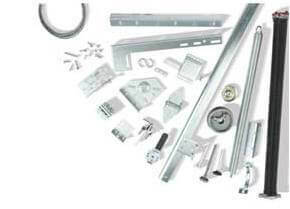 Your garage door system comes with a counterweight system, which is made up of springs. Normal wear (or even breakage) can occur over time due to the extensive weight and pressure of your garage door. It is important to remember to maintain and/or repair/replace your springs, as they are central to the garage door opening and closing process. If your door is equipped with torsion‑type springs, apply a lubricant (for example motor oil) and wipe off the excess to keep them in good order. On the other hand, if your door uses extension‑type springs, it is dangerous to maintain them yourself. These springs are under high tension, and must be securely fastened with a security cable. If your system does not have one, we strongly advise you to have one added by one of our fully trained professionals. To ensure the long term reliability of your garage door, whether equipped with extension or torsion springs, have them regularly inspected and maintained. Becoming a member of Crosby Garage Door Co.’s preventative maintenance program is a great way to avoid issues arising with your garage door, whether residential or commercial. On an annual basis, our team will examine your system, change or repair the parts that need servicing, and will ensure that your system functions smoothly! Give us a call at 724-834-8450 today and we can answer all your installation, repair and maintenance questions you may have about your garage door system.